Fall is a great time to check out new schools for the next year without pressure. Some German schools in California offer great opportunities for students and parents alike to tour their campus this fall. Taking advantage of traditional seasonal events that are open to the community, or attending an Open House gives you a good idea what a particular school community is like, and let’s you connect to teachers as well as the school’s community at large. You can form a first hand opinion of whether this school is right for you, and can be ahead of the race once the application process starts in January and February . Starting this October, GISSV has several Open House Events scheduled during the 2013/14 school year. Find the one right for you. The school has three different campuses, Mountain View, Berkeley and San Francisco. Furthermore, mark your calendar for December 14th . GISSV has a special treat in store for you. The school organizes a traditional Christmas Market from 11.00am to 9.00pm right on Townhall Square in Mountain View with 10-30 stands for the typical Christkindl-Market Flair. AEA’s 12th Annual Lantern Festival is almost here! Is has become a wonderful tradition for the whole family to enjoy. Join AEA in celebrating a 100-year-old German tradition with food, games, fun activity booths, a vendor market, and entertainment, ending with a traditional lantern walk around the neighborhood. An even bigger and better festival is planned for this year with more activities for the Middle School students. Great entertainment from the German Cultural Committee, traditional food, the carnival, Martins market, inflatable jumpers, and of coarse our traditional lantern walk. We will be adding special activities for the older kids that include a photo booth and a fabulous video game truck, so that all ages can participate and enjoy this great AEA tradition. See a performance by our children, join us in singing songs and during our annual lantern parade. You can bring your own lantern or buy one from us! The German-American International School in Menlo Park has a few dates to offer to get to know their school as well as student body including a St. Martin’s Laternenfest on November 8th! St. Martin Lantern Parade – November 8, 2013 On Friday, November 8, 2013 at 6:00 p.m., the traditional lantern parade celebrating the legend of St. Martin will take place at GAIS. Martinstag is all about giving to others and shedding light in the darkness. The event begins with a “Shadow Play” and the lighting of the lanterns, followed by a walk around the neighborhood. Monday, November 11, 8:30am – 3:00pm: Open Classroom Day On this day, our classrooms are open for the public and anyone interested in our school. Join us for this day and get a glimpse of the daily life, the academic programs, the curriculum and much more at the German-American International School. Monday, November 11, 7:00pm – 9:00pm: Information Evening & Parenting Workshop There will be an Information Evening including a Parenting Workshop conducted by external presenters for prospective parents and families taking place in our library. Saturday, December 7, 2:00pm – 5:30pm: Holiday Winter Fest 2013 Our annual and traditional Holiday Winterfest takes place on Saturday, December 7, 2013, from 2:00pm – 5:30pm on our campus. The Winterfest will feature shops, café, baked goodies, food, hand-made arts and crafts, a visit from Santa, a raffle and much more… In addition there will be again wonderful musical performances led by our Music Teacher. Join us for this wonderful event! Wednesday, January 8, 7:00pm – 9:00pm: Information Evening & Parenting Workshop There will be an Information Evening including a Parenting Workshop conducted by external presenters for prospective parents and families taking place in our library. Thursday, March 8, 7:00pm – 9:00pm: Information Evening & Parenting WorkshopThere will be an Information Evening including a Parenting Workshop conducted by external presenters for prospective parents and families taking place in our library. The Open House event with two different tours is schedule for October 30. There will be two tours offered that day: 3:30-4:40pm and 4:30-5:30pm. Should you be interested in attending, please send an email to TivoliRainbowGarden@gmail.com so the school can plan accordingly. The German preschool has room for 13 children yearly within the age group of 2.5-5 and offers half day and full day programs. For more info please visit the website. Holiday Bazaar – Lantern Walk on November 8th The school offers general Tours of the campus anytime even Saturdays, which can be scheduled at any time through the school office. KinderHaus International Preschool in the Mission District of San Francisco hosts a Lantern Fest in San Francisco on November 15th. 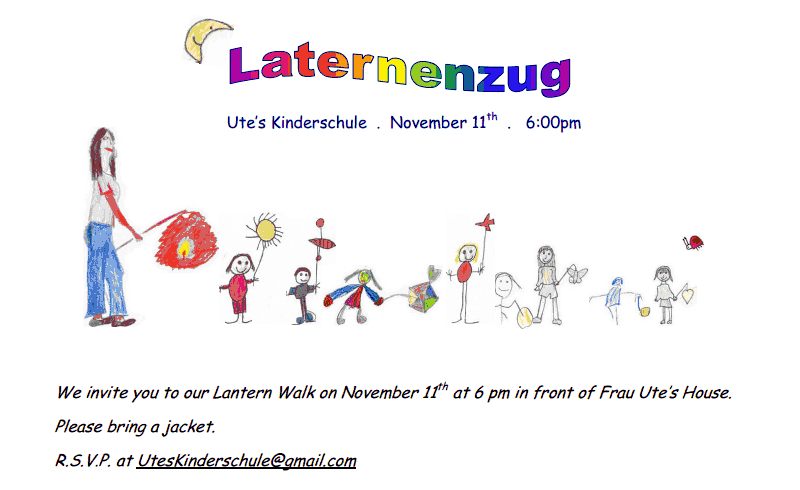 Please join families of the school at 5pm to go for a traditional lantern walk starting in Dolores Park and ending at the KinderHaus. There will be hot cider, wine & beer as well as a potluck with ‘Brezeln’ and sausages right after the walk. Suggested donation per family is $10. Handmade lanterns will be for sale in case you don’t have your own. For more information visit the website. The school offers language immersion in German, as well as 3 other european languages. You can tour the school anytime with an appointment. Please go to the schools web page Franklinmagnetschool.com and find the link to sign up for a tour, or contact Ana Jones: Ajones@gusd.net (818) 243-1809. To stay informed about their various community events please sign up for the weekly news-blast.